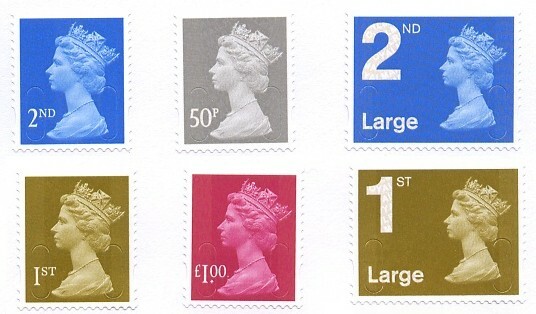 2nd & 1st class, 2nd & 1st class Large, 50p & £1, together with the higher values, were issued on 17 February 2009. Retail booklets and Business Sheets were issued in March 2009. Of course we knew from the outset that the overlay included the words ROYAL MAIL. It was only in April 2009 that we dealers and collectors found out that the stamps were coded to identify their source, with B for Business Sheets, T for booklets of 12, S for booklets of 6, and C for mixed booklets of 6, with F for booklets of 4 large letter stamps. But in April 2010 Alec Withell reported the MA10 code in the London 2010 advert booklet, and the process has continued from there. So how to keep these in the album? I asked myself this question as I have been sorting the 2011 versions, arranging them on a stock-card to make sure that we have all the variations for all the standing order customers. What we are distributing early next month consists of the last two 2010 2nd class Large, the 2010 Recorded Signed For, all the 2011 NVIs so far available (14), plus the litho-printed stamps from the Wm Morris PSB. Maybe it is best to keep them as year sets, based on the code rather than on the date of issue or discovery? Many do not have a specific date of issue, although some do, and the last two 2nd Large MA10 stamps have been discovered well into 2011. For those who follow the catalogue there is no easy answer because the many variations are not shown in the basic (Concise) catalogue. And, for example, because the MPIL 50p from 2010 is gravure and the 50p from 2011 is litho it is likely that their catalogue numbers will be distant. Better then, maybe, to keep them together by 'value', with a page for the 2nd class small, another page for the 1st class small, and so on. What do you do? I suspect many collectors will keep these as a work-in-progress collection on stock pages. Because I thought it would be easier I have allocated a page to each stamp (not value), and arranged them by year - but if there is an order, for example, for all the business sheet stamps then the 2nd class from 2009 (2911) is often followed by the next two, 2911.0 and 2911.1 - which involves much back and forth in the stockbook to pick an order! Let everybody know if you have found another solution - please leave a comment here. One of our correspondents has suggested the Deegam system for arranging stamps, by value"
"Certainly, DEEGAM is absolutely based on date of issue, and the inability to pin down recent issue dates hasn't helped the current situation. For instance, 1st class issues printed by De la Rue have been running in a sequence beginning with N1.47.## with ## being the next in date order sequence. This signifies the basic 1st class stamp is "N1," the De la Rue version of it using security codes and being self-adhesive is the 47th version in time, and the "##" is the minor difference of the 47th version, actually "N1.47.4," as near as I can tell from date order, for the counter sheet with the 10 code. Since Walsall has the 48th version in time, you can logically figure out "N1.48.7" will be a Walsall-based version in the sequence. Substitute "LN1," LN2" and N2" for 1st class large, 2nd class large, and 2nd class, and you have a system based on logic that anyone can understand PROVIDED you have firm issue dates." And therein lies just one of the problems with this system. Even where Royal Mail have announced issue dates for booklets we know that some have been available 'on the streets' (ie in small retailers but not POs) before that date. These are not 'pre-release' they are just part of the normal distribution by Royal Mail. 'Issue dates' or '1st day of availability' means philatelic, not actual. And although I admire Doug for the work that has gone into the Deegam system, it is far too complex for me and is based on only ONE logic. It is equally logical to arrange a collection in some other ways. Deegam uses a special sign to denote a date of printing rather than date of issue and this is used for the first known occurences of changes in the hidden codes for year dates thus avoiding any difficulty in maintaing chronology as the main criterion for listing singles. Thank you, Douglas, for the clarification. As a collector - before I was a dealer - I was content with basic collecting, though if they were 'visibly different' I would collect variations. Since the introduction of the security codes it makes sense to me to collect all the visibly different even if Royal Mail doesn't identify them as such and if they are not sepaately identified in basic catalogues. If anybody wants to provide a cross-reference between my numbering and any other I am quite happy for them to do so, and will willingly publish it. As a long-time user of the Deegam system, I’d like to comment. Though the listings are in chronological order, to me that is incidental. As we know, a stamp can be printed and then held for a while before release, so stamp A may be printed before stamp B, but B is put on sale before A. I don’t mind if A comes before B in the Deegam system, though other may think differently. Also, the chronology is within the Deegam levels 2 and 3, not across levels. So while the N1.46.1 (the first N1.46) will come before or on the same day as N1.47.1, the next variety N1.46.2 may appear months or even years after N1.47.1. And indeed there are many other ways to arrange a collection. It is easy to arrange a collection by various characteristics – printer or printing method or paper/gum, for example – and then use Deegam numbering for individual stamps. After considerable thought, I decided to break my collection into three major sections – pre-elliptical perfs, elliptical perfs and self-adhesives – and use Deegam within them.